Virgil Abloh unveiled the last of his ‘The Ten’ collection with Nike, but it seems there could be at least one more silhouette on its way. Courtesy of Instagram account ‘s.sam.group’, a set of newly-released images indicates that another collaboration with Nike-owned Converse will arrive soon. The photos reveal a close-up look at a purported Off-White x Converse ‘Chuck Taylor’. 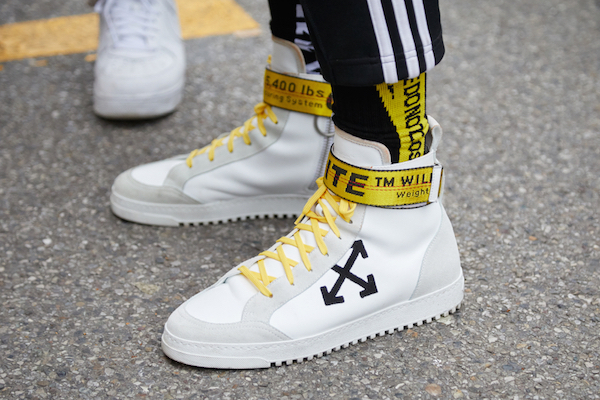 This canvas iteration appears to be more subdued in design as opposed to Abloh’s other sneakers, and features black and cream uppers with Off-White’s crossed arrow branding on its midsoles. Sneakerheads, have a sneak peek of what might be in store for you in the images below—but if you can’t wait, you might want to get your hands on Off-White’s floral leather sneakers, which are now retailing online.